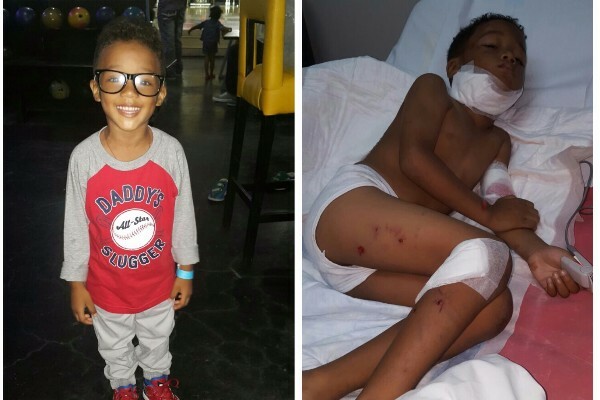 When Aleiya Chin left home in Manor Park, St Andrew, with her two children in the early hours of Wednesday, March 2, the furthest thing from her mind was that within moments, her four-year-old Joshua would nearly meet his end — mauled in the street by a neighbour’s blood-thirsty, ferocious dogs. Aleiya said that she and the children, Joshua Zhang — now five — and his then two-year-old sister Kendra, passed the dogs lying in front of the neighbour’s open gate by the side of the road, then seconds later, the nightmare began to unfold. “By the time we were stepping off, I just saw the two dogs get up coming towards me. I didn’t run off, I held the two of them and put them behind me. I tried to stay close to the curb wall so that, if anything, they would bite me, and not the kids,” the single mother remembers. The mother said she continued to cry out for help, in desperation, as the dogs would not let up from attacking her child. Her attempts to chase off the animals were futile and, at the same time, she had to focus on keeping her other child from being attacked. Finally, a passerby drove up and tried to get the boy away from the dogs, but he too soon found himself in some amount of trouble, overpowered by the dogs numerous times. From there she said she was referred to the Bustamante Hospital for Children where Joshua, with serious wounds to almost his entire body, especially a troubling spinal injury, would remain for two weeks. She said she realised also that when the child spoke, she could barely hear him, but was at the time reassured by the physician caring for Joshua that he was perhaps just hoarse from crying out during the ordeal. She said that eventually the medical team performed a vocal cord surgery (micro-direct laryngoscopy with excision) on June 15 and removed a sample which was sent off for biopsy. Still, she has not received the results of that test. Aleiya said that not knowing the extent of the damage to her son’s vocal cords is a constant source of worry and anxiety for her, as his voice is now almost inaudible. She said that the hospital conducted yet another DL on Joshua on August 4, at which time she was still being told that they had not received the result from the previous biopsy. His spinal injury is also weighing heavily on her mind, as she said she was told following various scans, that based on the damage to his spine, “he was almost about to be paralysed”. After spending what she said amounted to approximately $400,000 on medical bills, Aleiya is now no longer willing to sit and wait on test results while Joshua may be in danger of paralysis or losing his ability to speak altogether. She is determined to get other medical opinions on Joshua’s situation and to seek treatment that will determine what course of treatment he needs to improve his condition. Aleiya said that the small child now lives with pain, and cannot walk very far due to his injuries. He is back at school, but is restricted from all extra-curricular activities. “He is upset because he likes football and wants to go back to playing,” she remarked. Not only does Joshua no longer gets to enjoy many of the activities little boys his age relish, he constantly relives the horror of that fateful morning, often crying out in his sleep, according to Aleiya. A make-up artist, Aleiya said that her savings have been wiped out, but she is pressing on to get help for little Joshua. She said that she is finalising arrangements with a hospital in New York to conduct the assessment and then decide on the best route for treatment, but urgently needs financial donations to make that happen. Aleiya, who is assisted by her own mother with her two children, said that the owner of the dog has not assisted with any of the medical expenses, and that she has been informed by the authorities that the incident is a civil matter that has to be taken up in court. Makes my blood boil thinking of those discusting Devils savaging a little boy while his mother is helplessly fighting for her children's lives. I can't think of anything more terrifying than this scenario. The dirtbag owner should be hung in the streets for this. If you own these dogs then you better be ready to lay down your life when they attack the innocent this way. It shouldn't have happened!! !